Marijn Heule kindly sent me an email on the 10th of April about DRUP, the new system used this year in the SAT Competition’13 for the UNSAT track. He kindly encouraged me to implement the DRUP system. He personally implemented it into Minisat which was a very helpful lead for me. In this post I will talk about my experiences in implementing DRUP into CryptoMiniSat within a span of 3 days. So, it’s a bit messy code. Other than this, the implementation went very smoothly. The biggest pain was not to forget to add to the DRUP output all changed clauses. Since I have implicit binary and tertiary clauses and I manipulate them in-place, they are changed in quite complicated code paths. 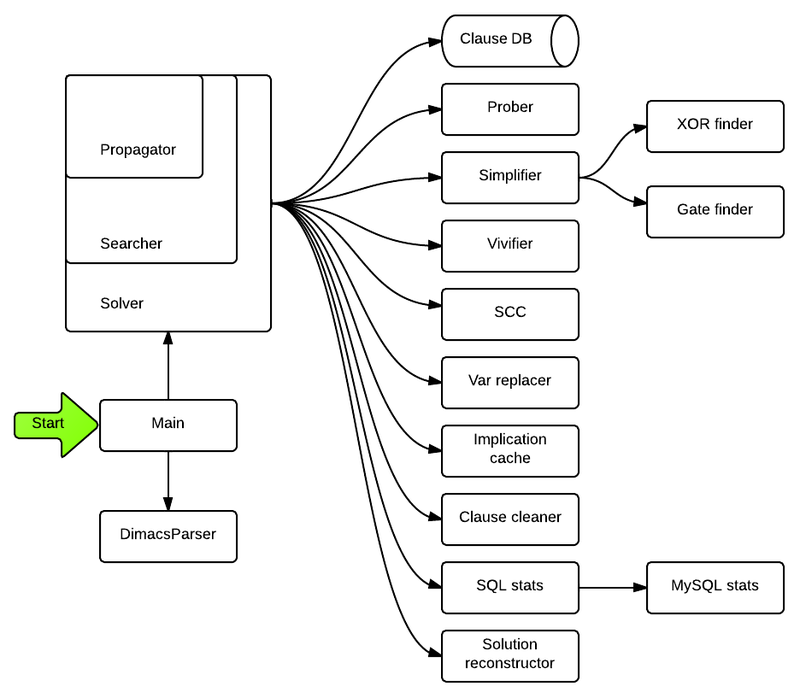 If you don’t have such complicated code paths, you should be able to implement DRUP within a day or less. I encourage you to do so, it’s quite fun! I am a bit confused about whether some of the optimisations in CryptoMiniSat work with DRUP. I have been fuzzing the DRUP implementation for about ~1000 CPU hours, but not with all optimisations turned on. Some are a bit shaky. In particular, XOR and stamping&caching come to mind. I cannot turn DRUP on for the top-level XOR manipulation because otherwise I would need to tell DRUP every Gaussian elimination step. Not funny, and not fast. Well, XOR is not such a big thing, and it is no longer natively implemented in CryptoMiniSat, so not a big deal, really. The other, more troubling one is stamping and implied literal caching. Luckily I have on-the-fly hyper-binary resolution (this is needed for DRUP with Stalmarck if you think about it), so the binary clauses stored by caching and stamping are there… but they may get deleted by variable elimination, blocked clause elimination and… well, maybe nothing else. Hopefully not. Anyway, I never block binary clauses (does clause blocking ever help? I am confused) and I can of course not delete binary eliminated clauses from DRUP. However… that may make the verification very slow. So, I am at crossroads here. I think I will submit a version with stamping&caching and one without. In the end, every optimisation can be turned on except for XOR. I find that exceptionally good given the number of tweaks/hacks used by CryptoMiniSat. I think DRUP allows for a lot of possibilities. Naturally I first want to draw resolution graphs. There are plenty of libraries for 3D drawing, and I have already ordered the LEAP controller (a 3D controller), which will come handy to play with the resolution graphs (zoom&out, rotate, etc.). From there, I want to get stats out of the graph, and I want to present it next to/with the stats that I already generate. For example, how many of the deleted clauses get re-learnt later? How many clauses get used in the resolution graph with the empty node? How often when cleaning with glues? How often when cleaning with activities? For which types of instances? Linking this with real-world instances by coloring the graph points according to e.g. filter functions in stream ciphers is not very hard and should be quite a lot of fun. I think Marijn Heule deserves a lot of thanks for the work he has put into DRUP (webpage, example, DIFF for MiniSat) and all the help he has given me. I had some initial doubts about whether it’s possible to implement at all and I had some minor problems with the checker — he always replied kindly and promptly. Thanks! As many of you have heard, the SAT Competition for this year has been announced. You can send in your benchmarks between the 12th and the 22nd of April, so get started. I have a bunch of benchmarks I have already submitted about 2 years ago, still waiting for any reply from those organizers — but the organizers are different this year, so fingers crossed. What I want to talk about today is benchmark randomization. This is a very-very touchy topic. However, I fear that it’s touchy for the wrong reasons, and so I think it’s important to talk about it in detail. Benchmark randomization is when a benchmark that is submitted is shuffled around a bit. There are many ways to shuffle a problem, and I will discuss this in a bit, but the point is that the problem at hand that is described by the benchmark CNF should not be changed, or changed only in a very-very minor way, such that everyone agrees that it doesn’t affect the core problem itself as described by the CNF. Why do we need shuffling? We need shuffling because simply put, there aren’t enough good benchmarks and so the benchmarks of yesteryear (and the year before, and before, and…) re-appear often. This would be OK if SAT solvers couldn’t be tuned to solving specific problems faster. Note that I am not suggesting that SAT solvers are intentionally manipulated to solve specific problems faster by unscrupulous researchers. Instead, the following happens. Researchers test the performance of their SAT solvers on specific instances and then tune their solvers, testing the performance again and again on the same instances to check if they have improved performance. Logically this is the best way to test and improve performance: use the same well-defined test-set all the time for meaningful comparison. 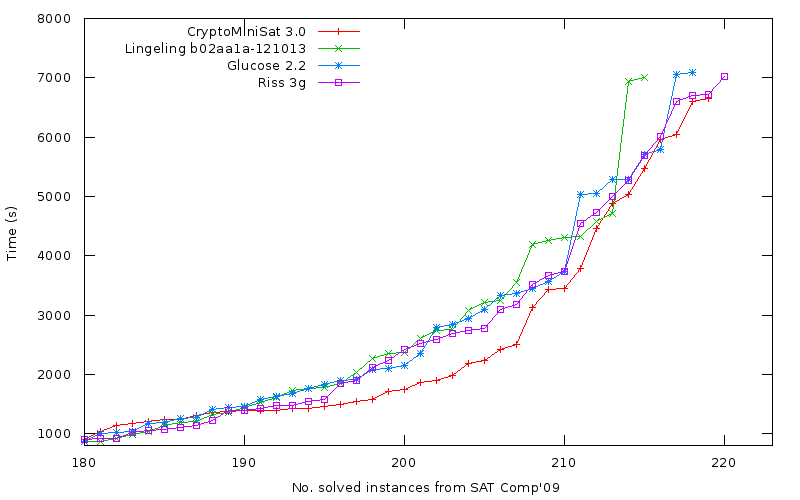 Since the researcher wants to use the instances that he/she thinks is the current use-case of SAT solvers, he naturally uses the instances of SAT competitions, since those are representative. I did and still do the same. So, researchers add their idea to a SAT solver, and test. If the idea is not improving things then some change is made and tested again. Since modern CDCL SAT solvers behave quite randomly, and since any change in the source code changes the behaviour quite significantly, a small change in the source code (tuning of a parameter, for example) will change the behaviour. And since the set of problems tested on is fixed, there is a chance that more problems will be solved. If more are solved, the researcher might correctly interpret this as a general improvement, not specific to the problem set. However, it may very well be generic, it is also specific. The above suggests that the randomness of the SAT solver is completely unintentionally tuned to specific problems — a subset of which will appear next year in the competition. Propagate variables. Unitary clauses are often part of benchmarks. Propagating some of these, some recursively, gives quite a bit of problem space variation. Propagation is performed by every CDCL SAT solver, and I think many would be surprised if it didn’t help SAT solvers that worked differently than current SAT solvers. Agreeing on performing partial propagation is something that shouldn’t be too difficult. Renumber variables. For some variable X that is not used (or is fixed to a value that has been propagated), every variable that is higher than X is decremented by one, and the CNF header is fixed to reflect this change. Such a minor renumbering may be approved by every researcher as something that doesn’t change the problem or its structure. Note that if partial propagation is performed there should be quite a number of variables that can be removed. Renumbering some, but not others is a way to shuffle the problem. A more radical way of renumbering variables would be to completely shuffle them, however that would change the way the problem is described in quite a radical way, so some would correctly object and it’s not necessary anyway. There are other ways of shuffling, but either they change the instance too much (e.g. blocked clause removal), or can be undone quite easily (e.g. shuffling the order of the clauses). In fact, (3) is already quite a touchy issue I think, but with (1) and (2) all could agree on. Neither requires the order of the literals or the order of the clauses to change — some clauses (e.g. unitary ones) and literals (some of those that are set) would be removed, but that’s all. The problem remains essentially unchanged such that most probably even the original problem author would easily recognize it. However, it would be different from a SAT solver point of view: these changes would change the random seed of the solver, forcing the solver to behave in a way that is less tuned to this specific problem instance. SAT solvers are currently tuned too much to specific instances. This is not intentional by the researchers, however it still affects the results. To obtain better, less biased results we should shuffle the problem instances we have. Above, I suggested three ways to shuffle the instances in such a way that most would agree they don’t disturb or change the complexity of the underlying problem described by the instance. I hope that some of these suggestions will be employed, if not this year then for next year’s SAT competition such that we could reach better, more meaningful results. 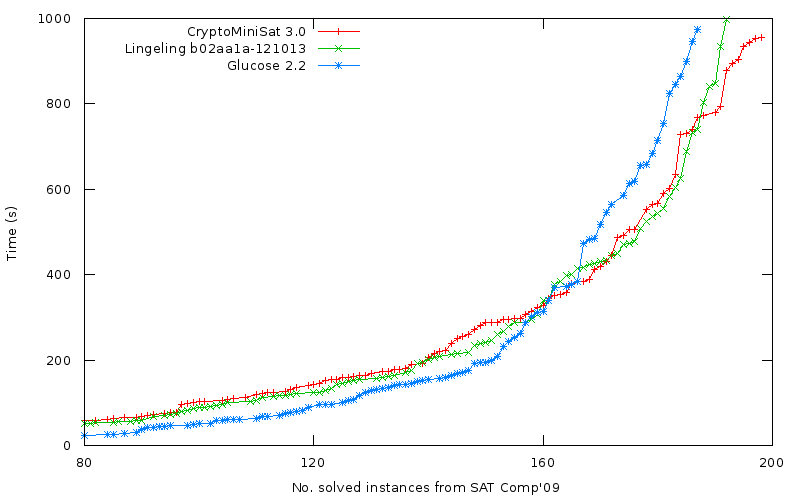 I have submitted three versions of CryptoMiniSat to the 2011 SAT Competition, all available here. The releases are commonly called “Strange Night”, after the music track of the same name. Inside the archive you will find 5 binaries and a PDF description. The five binaries are made up of two single-threaded, two multi-threaded, and a unified single- and multi-threaded binary. This latter is called techdemo, as it is more of a technological demonstrator than anything else, and was developed in collaboration with George Katsirelos and Laurent Simon. All versions are collaborative, however, as they all have the hands of some people from the CryptoMiniSat development mailing list on them. To be honest, I am not overly optimistic of these binaries, especially since I couldn’t get the 3.0 version of CryptoMiniSat ready for the competition, on which I have been working on the past two months. I have tried to backport some features to the 2.9.0 branch to make these releases, and so the resulting executables are pretty unstable. The techdemo version is a broken 3.0 release, as it is missing the signature feature of fully shared clauses between threads. Since I have finally obtained a 4-core CPU — with hyper-threading for 8 “independent” threads — I am all the more optimistic about a fully-shared scheme. The upcoming 3.0 release will be specifically made to work in multi-threaded environments, and will suffer if launched in single-threaded mode. This architectural decision was made because multi-threading nowadays no longer seems optional: it’s a must. On the CryptoMiniSat mailing list, some people are reporting performance on 64-core machines — optimising for single-threaded environment (and having multi-threading as an afterthought) in these times seems like a broken approach.